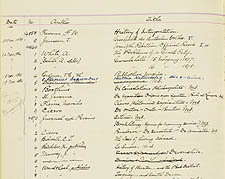 Shown here is the University Library’s accession log, recording George Lincoln Burr’s acquisition of several medieval manuscripts in Paris during the spring of 1885. Burr’s purchase, from the bookseller Maisonneuve & Co., included the works of Boethius, St. Jerome, and Cicero. Cornell University Library Acquisitions Department records, 1874-1988. Vol. 3.